Join the discussion on our forums! Come discuss Coldwraith over in our dedicated Coldwraith discussion topic. He's freezing his bones off! It's tempo frost mage, not freeze, dammit. 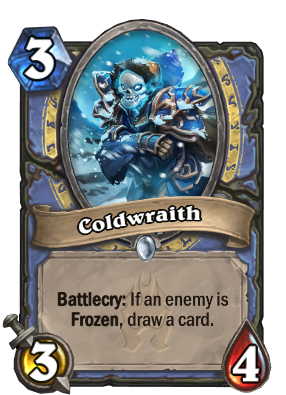 Get ready for freeze mage meta because of this card alone! Even better now that Breath of Sindragosa has been revealed. Yeah with Breath of Sindragosa released. You might run x2 Glacial Shard with it as well. Pointless downvote. Even Firebat said it will go into Freeze Mage over Acolyte of Pain. This card is is quite good for arena just based on its stats. For constructed, this will be a staple card of a new deck type; Aggro Freeze Mage. Drawing cards is always great in every situation. I see some serious meta changes incoming. Freeze mage will make a come back and this card is one of the reasons. Some value and additional carddraw, while freezing the board. This is huge! And if the starting hand is really bad, its a very good 3-drop. This card will really boost freeze mages. I can see your point, because freeze mage does not rely on minion-damage to win. But just 22 cards in freeze mage are taken. This minion has consistent card draw. It's really not a problem to freeze something. When freeze mage goes against a minion-heavy deck, aoe and hard-removal are key, but getting a little more value on board is not that bad, whether it is through trading or chipping dmg in, if you don't get this alex. Nice stats but you can't really play it on curve. There aren't that many freeze effects you can play before turn 3. you'd probably just play Arcane Intellect. What's the point? freeze status will fade away on your next turn. This is just a strong card in general. Not much is better than a 3/4 on curve aside Tar Creeper and on later turns, you have a means to cycle cards. Frost Nova + this guy + Doomsayer For Value overload! !